Keep Your Workstation Clean and Save Loads of Cash With Our Striped Cotton Bar Towels! Whether you own a restaurant or bar or you cook and clean in your own home, it’s important to keep a hygienic workstation and surrounding area. Too often we unwittingly spread germs and disease around, even when we are trying to clean our spaces. Simply touching a contaminated surface and then touching another surface can spread germs quickly in a location. How much more could the germs spread when you attempt to clean up a spill or mess with one towel and then use that same towel to dry off already-clean surfaces? A simple solution could be utilizing paper towels to clean up any messes in your workstation, but the cost will add up quickly. Luckily, there’s an even better solution out there for you – use cotton bar towels and mops with different colors! Why does it matter that these clothes are in different colors? Simple – it helps you color-code your cleaning system. For example, you could use cotton bar towels with blue stripes to clean the bathroom, cotton bar towels with yellow stripes to clean up any messes and food-related spills, and cotton bar towels with green stripes for deep cleaning in the kitchen. You will find that in using color-coded cotton bar towels that the possibility of spreading germs and disease around decreases greatly. Your wallet will profit from using color-coded towels and mops as well. Think about it. How often do you purchase paper towels for your business or home? Probably frequently, especially if you own a business. 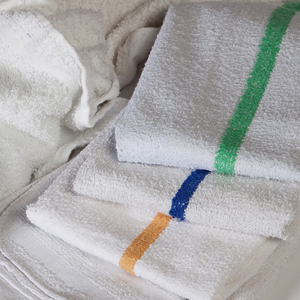 Using color-coded towels will greatly help in cutting down the amount of money you would typically spend on paper towels. Once you’re done cleaning up, just toss the towels in the laundry and wash them. You will have them ready for your next cleaning session, absolutely free! If you’re ready to have a more hygienic workstation and more money in your wallet, start by investing in our cotton bar towels and mops! These are top-of-the-line, 100% cotton towels that are perfect for general maintenance tasks and are very durable and absorbent. We also feature bar mop towels with colored stripes to help you with your color coding! Ready to get started? Call us at 314-421-3311 or visit us online at www.uswiping.com! We have plenty of great products for just about any mess, spill, or need you might have! As a business owner, you know that it’s essential to run a well-oiled and efficient business in order to make any sort of profit (and keep several satisfied customers as well). But have you ever considered keeping a clean office to be near the top of your daily to-do list in your place of business? When you make cleaning a priority in your office, you’re not just keeping a professional profile. You’re also helping your employees become more productive, keeping your customers and employees safe, and prolonging the life of your equipment. Here are 5 tips to help you keep a clean office! Discourage Eating Lunch at the Desks – Employees tend to just eat their lunches at their desks, hoping to be efficient in getting work done while eating. Not only is this not particularly a healthy practice for your employees, it also can be messy and unprofessional if clients come in and see loose crumbs and wrappers around the workspaces. Instead, encourage them to eat in the break room or outside of the office to both enjoy themselves and keep their spaces clean at the same time. 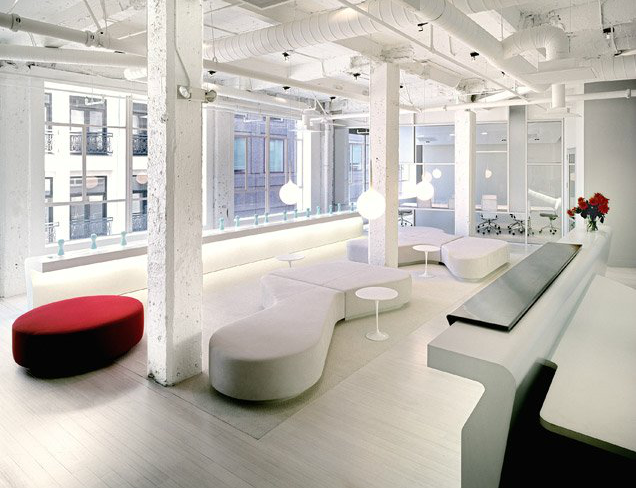 Keep Common Areas Clean – High-traffic areas can become dirty quite quickly. Take the time to straighten up high-traffic areas and clean them properly. Consider delegating the cleaning to all of your employees. When everyone works together and cleans, it goes by much more quickly and everything gets cleaned as well. Take Care of Office Plants – Plants can help liven up an office space, but if the plant is shedding leaves, it can look quite unprofessional to customers. Make sure to water the plants often and pick up any fallen leaves frequently to maintain a clean look. Keep Desks and Counters Clean – A clean desk is a happy desk! Make sure to keep spray bottles of wood and glass cleaner and hand wipes in the office to help wipe down dirty and smudge-covered tables and desks. Don’t forget to clean around and behind desks, couches, chairs, and other pieces of furniture. A cheap floor vacuum or sweeper will work perfectly and make cleanup a quick and easy task. Disinfect the Restroom – A clean bathroom isn’t just necessary for a clean company office; it’s important to keep it clean and tidy for the safety of your employees and customers. Strive on cleaning the restroom(s) every day. Remember to scrub the toilet bowl and seats, wipe down the sinks and counter areas with a disinfecting cleaner, sweep and mop the floors, and refill soap dispensers, paper towel holders, and toilet paper dispensers. Cleaning the office and keeping it looking nice and tidy is easier than ever with our products! We have all that you could possibly need to keep your office space clean, including pre-moistened hand and surface wipes, cleaners, and soaps. Our Mayfair and Toolbox lines of hand and surface wipes, cleaners, degreasers, sanitizers, and soaps can help you virtually wipe out germs and bacteria in mere seconds. Get started on the road to cleanliness by calling us at (314) 421-3311 or visiting us online at www.uswiping.com!